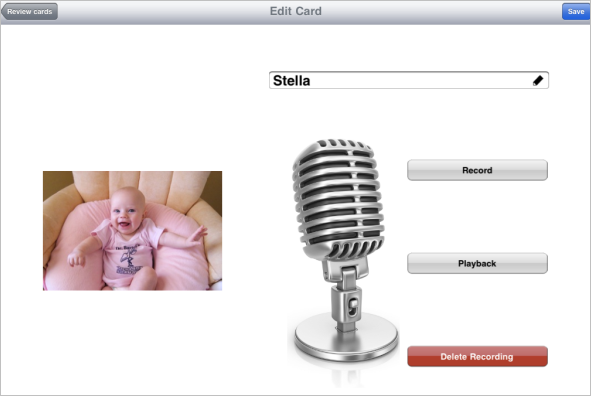 Customizing the “My First Words” app for Stella so easy! I took pictures of familiar objects around the house, added photos of friends and family, and recorded my voice next to each entry. For 40 new words, the whole process took me under an hour. Thank you so much for your help and support. Unfortunately, we had some problems with the latest update of the app and will bring it back again in the near future. I hope they work out their issues soon because this really is a fantastic app! Posted on May 13, 2011, in 11 months, App Reviews, photo, video and tagged baby, custom, flash cards, iPad, iPad 2, my first words, record your voice, SmartBabyApps, words. Bookmark the permalink. 2 Comments.